Dr Rundi (third left) presents a souvenir to Abang Johari while Tiong (left) and Talib look on. 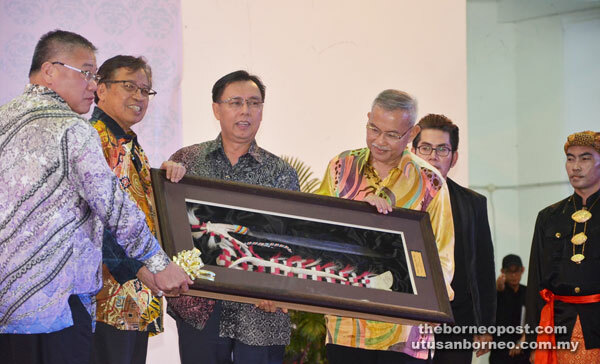 BINTULU: Chief Minister Datuk Amar Abang Johari Tun Openg has announced a RM250 million-allocation to build an iconic bridge over Kemena River connecting Bintulu with Jepak on the other side of the river. The project would be completed in three years, he said during the leader-meets-the-people session at the civic centre here on Wednesday evening. “It is not just an ordinary bridge as it has an iconic design,” he said. He added that once completed the bridge would help in the development of areas on the other side of the river (Jepak) where a township much like Petra Jaya in Kuching would be built. Without disclosing when the project would kick-off, Abang Johari said construction would commence as soon as possible. “This area (Jepak side) will be an icon of sorts for Bintulu as we will also build a government complex, complete with a new Resident’s Office and commercial and housing estates amidst green surroundings. “I hope the prices of houses there will not be as expensive as they are today. On the possible name of the new township, the chief minister said he would leave it to the people to decide. This was Abang Johari and his wife’s second official visit to Bintulu after his becoming chief minister. On Wednesday, he officiated at the opening of Sakura Ferroalloys plant in Samalaju Industrial Park, and later chaired his first meeting as chairman of Bintulu Development Authority with board members, during which he approved the design for the iconic bridge. Minister of Public Utilities Dato Sri Dr Stephen Rundi, Assistant Minister for Infrastructure Development Datuk Talib Zulpilip, Bintulu MP Datuk Seri Tiong King Sing, heads of government department and community leaders were among those present at the session.